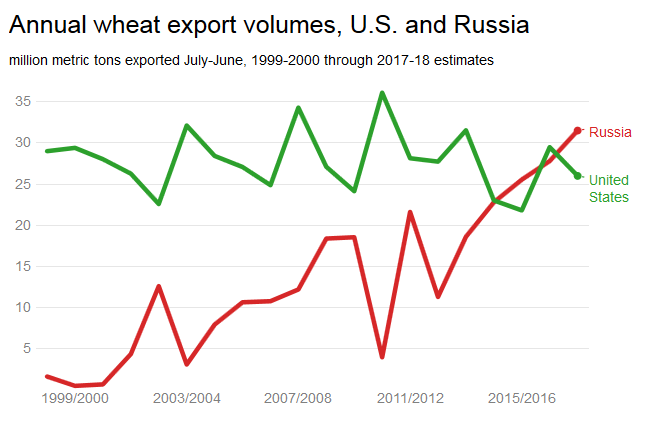 Russia briefly surpassed the United States as the top global wheat supplier in 2016, and the two top global suppliers have been neck and neck since, but recently the US market share has been on a dramatic decline due to Mexico increasingly turning to alternative suppliers like Russia amidst escalating trade tensions with its northern neighbor. This despite soaring Russian prices and a new setback to the Russian crop from drought. The US has been Mexico's primary supplier since the 1994 North American Free Trade Agreement (NAFTA) took effect, but American suppliers are alarmed as Mexican millers begin looking elsewhere with the threat of tariffs looming, a trend since Donald Trump famously labelled NAFTA "the worst trade deal ever" signed by the US, followed by his April 2017 threat to pull out and has since called to renegotiate. A recent Reuters report finds that "the U.S. market share decline is accelerating as Mexico casts about for more alternative suppliers in Latin America and elsewhere to hedge against the risk that U.S. grains will get more expensive if the Mexican government imposes tariffs, according to interviews with three large Mexican millers, international grains traders, the top Mexican government agricultural trade official and government and industry data analyzed by Reuters shows." 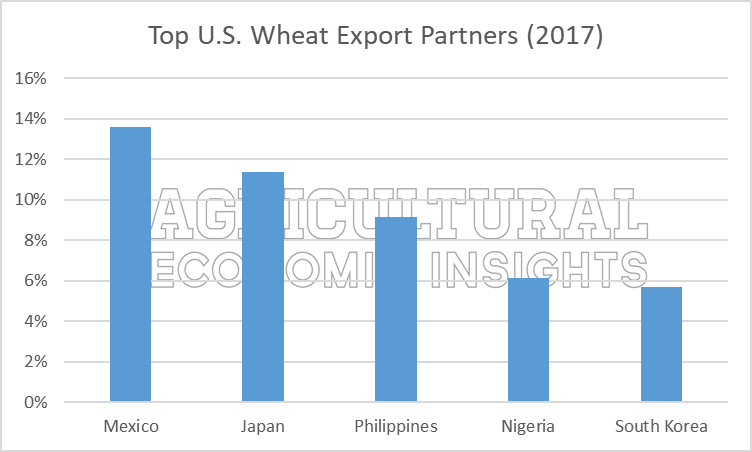 Worldwide, in the opening half of 2018 total US wheat exports dropped 21 percent, while exports to Mexico fell by a whopping 38 percent, to $285 million. This comes as last month Trump made good on prior threats to roll back NAFTA and begin anew — "a bad deal for U.S.A. Massive relocation of companies and jobs" with "large trade deficits with Mexico and Canada," the president tweeted back in March — by levying a 25 percent tariff on steel imports and a 10-percent tariff on aluminum imports from Mexico, Canada and the EU. Predictably, Mexico alongside the EU retaliated with import tariffs on select American products, including steel, apples and pork. President Trump has continued to warn "Tariffs on Steel and Aluminum will only come off if new and fair NAFTA agreement is signed," even while offering US farmers cash to get them through current tough times — in the form of his $12 billion emergency farm aid plan announced Tuesday — that many fear will not be enough to repair damage to necessary long-term trade partnerships abroad. Russia became the world's top wheat exporter in 2016, but recent drought could bring put the US back on top. Meanwhile, Russia has come in to fill the gap as producers of Mexican bread, pasta and flour tortillas look for cheaper supplies of wheat, and while Mexican companies are increasingly worried over substantial rumors that Mexico could in return target $4 billion in annual imports of US corn and soybeans. Jose Luis Fuente, head of Canimolt, a major Mexican trade consortium representing 80 percent of Mexican millers, told Reuters, "It’s important to send signals to Mr. Trump,” adding that Mexico must always be somewhat reliant on US wheat due to proximity, but that "we can’t continue to have this absolute dependence." Mexico is also reportedly planning to increase wheat imports from Argentina, Brazil, Canada and Ukraine to see itself through the crisis. Though it's unclear whether Trump's Monday afternoon comments at a White House "Made in America" event announcing he's currently considering "very dramatic" trade action with Mexico as newly elected Mexican President Obrador Andrés Manuel López Obrador prepares to take power, what is clear is that the US industry will have to patiently watch as Russia and others take the spoils. "Negotiations are going really well, be cool," Trump tweeted Wednesday. "The end result will be worth it!" Though we can't imagine that American farmers are taking too much comfort in these words.